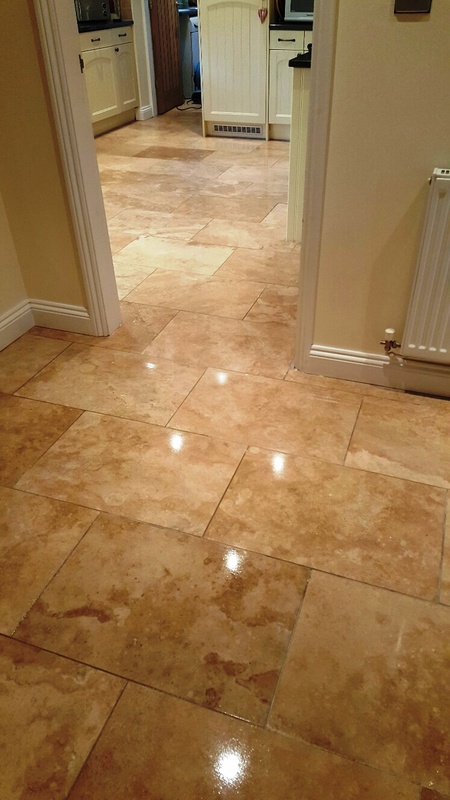 Quite often our customers will be new property owners who have inherited fantastic tiled floors that are in need of smartening up. 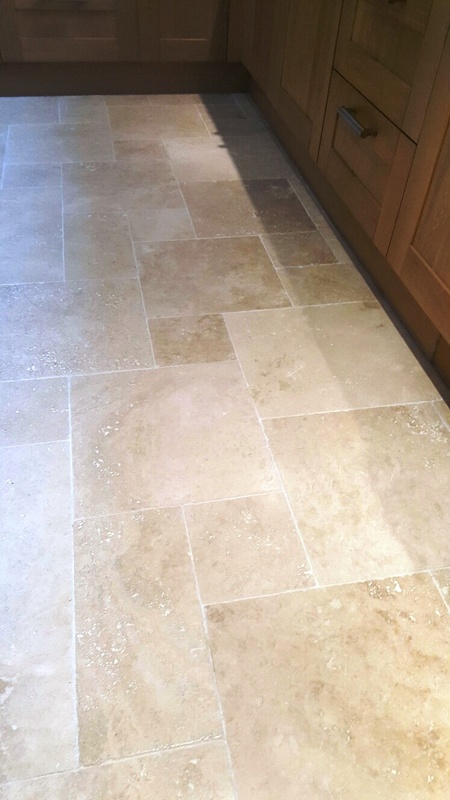 Typically the previous owners struggled to maintain the floor which is not unusual when it comes to high quality natural stone such as Travertine and this was the case with this Travertine tiled floor that I recently restored at a property near Woodhall Spa, on the southern edge of the Lincolnshire Wolds. 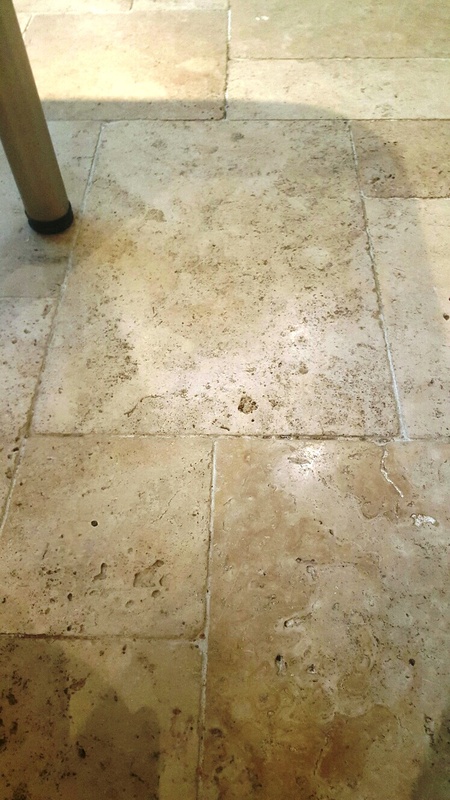 The customer not only needed a deep clean for the tiles and grout which had become dirty and discoloured over time, but also needed for many of the small holes caused by the natural process of pitting to be filled to give the Travertine tiles a smooth and polished finish. Finally, the floor would need a fresh seal to protect it and make it easier to cleangoing forward. 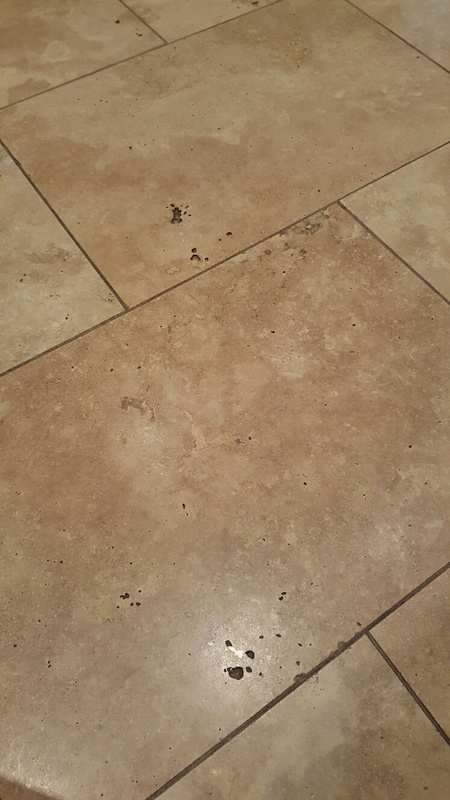 To begin the restoration, I applied Tile Doctor Pro-Clean to the floor, which is our reliable high alkaline cleaner designed for use on stone floors, left it to soak in and break down the dirt and then used our hot pressure Rotovaccleaning system to clean the tiles. The Rotovac is an expensive machine but makes light work of the job by deep cleaning and scrubbing the stone whilst rinsing and extracting away all of the soiled cleaning residue at the same time. 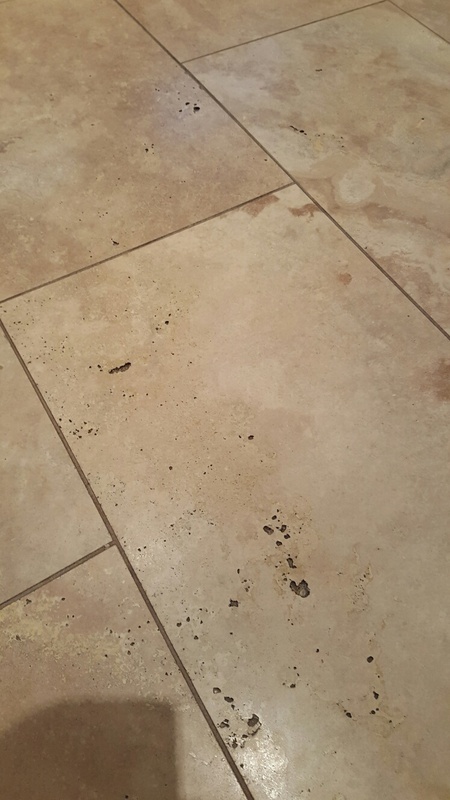 It allows us to get deep into the pores of the tile and grout to eradicate ingrained dirt and stains. I then worked through our four-stage diamond encrusted burnishing pad system which hones and polishes the surface of the tiles with excellent results. Each of the four pads is applied in turn, moving from a coarse grit all the way to a Very Fine grit. Once I was happy with the condition of the floor it was time to deal with the holes in the Travertine by applying a two-part colour matched resin to fill the small and large holes mentioned earlier.After completing the cleaning and filling was completed I left the tiles to dry off completely overnight aided with air movers to speed up the drying process. Ensuring the floor is bone dry before sealing is important as I needed to seal the tiles the next day, and a small amount of excess moisture can cloud the sealer and damage its performance. When I came back the next day I tested the floor for moisture to confirm it was dry before applying two coats of Tile Doctor Colour Grow, which is an impregnating sealer that intensifies and enhances the natural shades in the Travertine while also providing it with protection against dirt and stains. With the restoration complete I left the customer with a bottle of Tile Doctor Neutral Tile Cleaner for regular future maintenance, along with an aftercare leaflet. We recommend this product for the regular cleaning of sealed tiles as the neutral pH will help to maximise the life of the sealer and not erode it like many acid cleaning products. 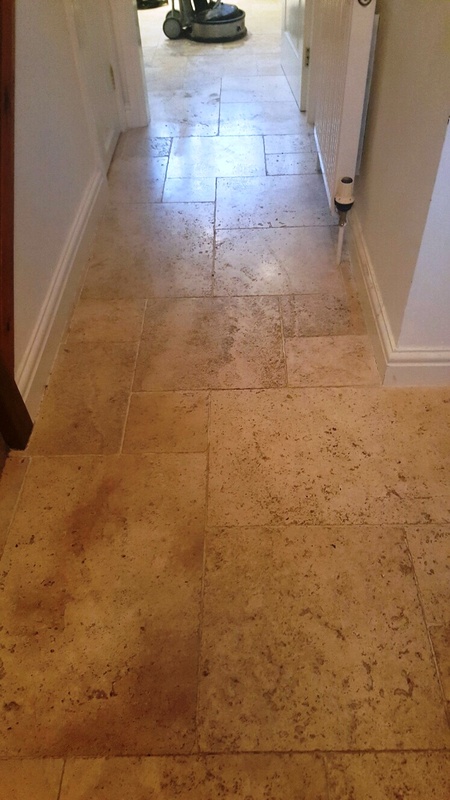 This fantastic Travertine tiled kitchen floor was in a bad way. Not only had it not been treated to a proper clean and seal in a long while, but it has also suffered from natural pitting, leaving lots of little holes that damaged the overall appearance of the floor. 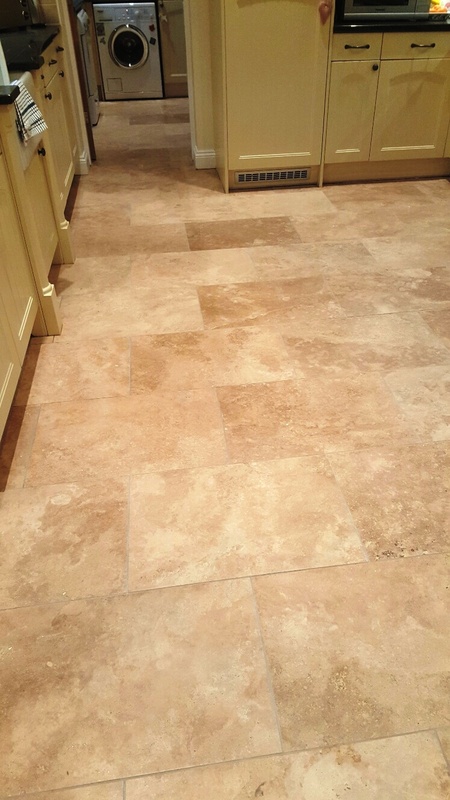 Travertine is very aesthetic, but suffers from the drawback of being quite soft compared to other types of stone (typically it sits between 3-4 on the Moh’s scale of mineral hardness). The customer, who lives in the town of Sleaford a small Lincolnshire market town, was keen to have the situation remedied through a complete restoration. This would need to include small repairs, along with a deep clean and a fresh seal. 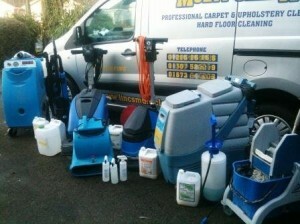 My first job was to deep clean the whole area, which I did using a solution of Tile Doctor Pro Clean and clean water. 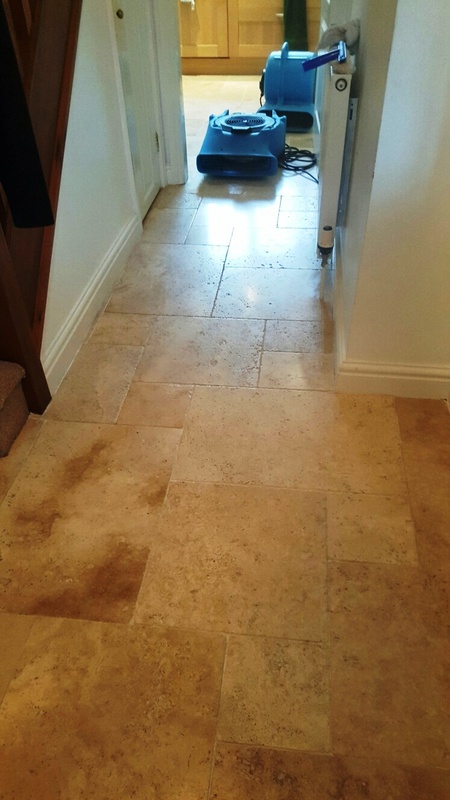 Pro Clean is a strong alkaline product which has a long history of producing reliable results of a wide range of natural stone floors, including Travertine, Granite, Limestone, and Slate. I applied the solution to both the tiles and the grout lines, and proceeded to scrub it in using a scrubbing pad fitted to a rotary floor machine. 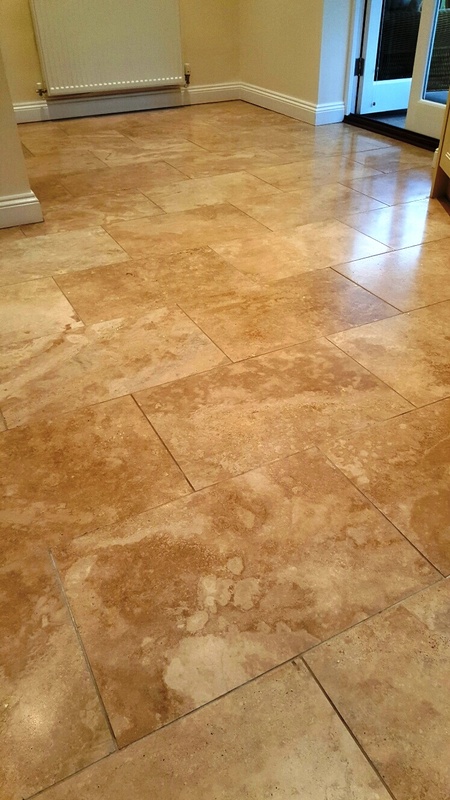 This left the floor fresh and clean, but I would also need to restore the polish to the Travertine to really take its appearance to the next level. To do this I used the process known as burnishing, which essentially involves the consecutive application of different gritted pads to achieve a high quality polish on tiles. Our burnishing system, which consists of four pads, achieves fantastic results on high-end polished stone like Limestone, Marble and, of course, Travertine. I started by applying the Coarse grit burnishing pad, before gradually working my way through to the Medium, Fine, and finally Very Fine pads to achieve a brilliant shine and light reflection finish. To round off the first day of the restoration, I used a flexible matching filler to fill up any pitted holes present on the surface of the tiles. Following this, I installed a turbo dryer to make sure the floor would dry fully overnight, and be ready to seal the following day. 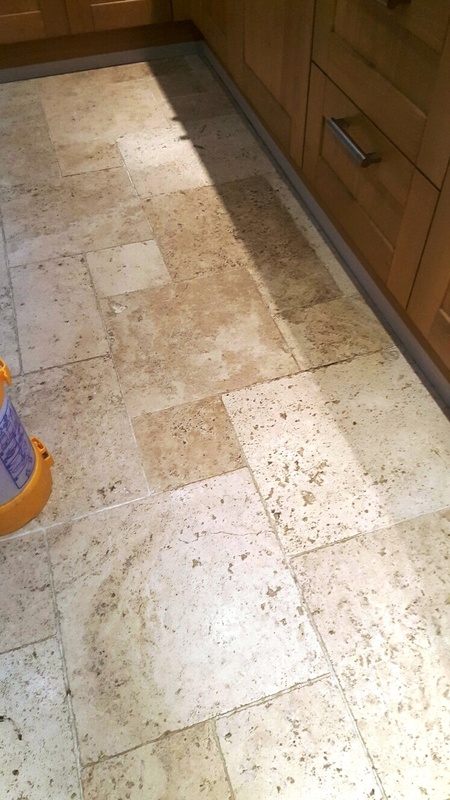 The next day I returned to the property and proceeded to seal the Travertine tiles using several costs of Tile Doctor Colour Grow sealer to protect the tiles and also really enhance the natural colours in the stone. As an impregnating sealer, Colour Grow penetrates into the stone and fills its pores to safeguard it against ingrained dirt and stains from within. Although initial thoughts were it was expensive, the final product and time involved in achieving the result confirms the price. There was zero mess whilst the procedure was carried out, done in a timely and efficient manner and am very happy with the result. I am delighted with the work done.The tiles look almost new. Phil did a brilliant job restoring the tiles in our hallway. He always replied promptly to my emails. Very friendly and professional service. I would highly recommend Phil. Phil was very professional, knowledgeable and courteous. The work was done to a high level and we’re pleased with the end product. Phil carried out his work when he said he would, to the price agreed and to a very high standard. The work was done very professionally and I would have no hesitation in recommending Phil and the firm. Mike Magill, Kirkby UnderwoodPhil has done a wonderful job. Our Victorian tiled floor looks marvellous! I would happily recommend him to anyone; he was very pleasant, helpful and diligent, informative at every stage, and quietly got on with transforming the tiles. He also gave lots of good advice on aftercare. Superb top-class professional job, we are delighted. Thank you to Phil. I contacted a number of businesses to looking for someone to clean and repair our tiles; most had no idea but from the moment I get in touch with Phil it was clear he understood the task in hand and what was required. Phils communication was great, he was always prompt and did exactly what he promised. And at the end of the day when he was done he left the space spotless.